From the Country collection, the Wrest is a classic women's parka made from a high-tech fabric that's waterproof and breathable. This stylish, practical coat is fully prepped to protect against heavy downpours, and its warm, micro fibre down lining protects against cold weather too. The two-way zip ensures the longer length allows good movement, and the studded zip guard fastens through to a cosy funnel collar and a generous fixed hood, both lined in cosy Sherpa fleece for extra insulation with a beautifully soft feel. 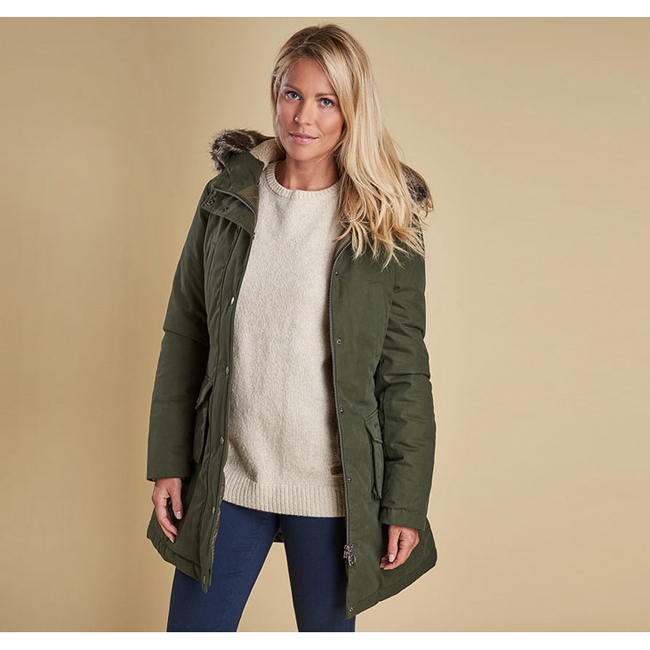 The hood is finished with a luxurious faux fur trim, creating the classic parka look. The Wrest is styled for a relaxed yet feminine shape, and boasts plenty of pocket space to keep hands warm and essentials at close reach. Contrast Barbour embroidery trims the lower left pocket flap, adding a subtle mark of authenticity. Very good product and the shipping was very fast. I went skiing and I was comfortable the whole day.